***Now Open*** We are proud to announce the opening of Red River Adventures Trout Resort on the Little Red River in Heber Springs, Arkansas. We are located on Winkley Shoals at 100 Swinging Bridge Drive. It is only a five minute drive to beautiful Greers Ferry Lake. 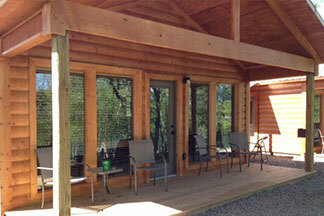 Enjoy watching the river roll by while sitting on the deck of one of our eleven new cabins. The cabins come fully furnished in a choice of one or two bedrooms. Red River Adventures offers cabin rentals, boat rentals, and a fishing dock. For more information, contact us at www.rratr.com or call 501-362-3327.